The aim of this project is to develop an intelligent wireless traffic service platform between cars supported by wireless transceivers beside the road. The primary applications are real-time local weather data, urban transport traffic management, and urban information broadcasting. Cars have integrated wireless transceivers to communicate with base stations located beside the road. In addition, cars may also communicate between each other as members of an ad-hoc network. Base stations provide real-time information (e.g. local weather) to the cars driving past. At the same time, cars gather real-time data (weather, traffic density) and deliver this information back to base stations. Base stations provide all gathered information to the central unit, which updates its databases and provides information on current traffic conditions, weather etc. back to cars driving past the base stations. 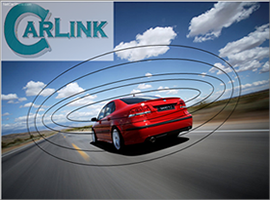 In the CARLINK project different kinds of wireless local area network technologies and ad-hoc networking are integrated as an evolutionary extension of WLANs, WiMAX, cellular networks as well as transmission network technologies. Integration of the various networking technologies is necessary to guarantee required coverage and data transportation ability everywhere in the application area, i.e., on highways and roads as well as urban street areas. The system will also have low-rate wireless connection (via GPRS) between end-users and central- unit, to provide urgent information in real-time. The coverage will be tested in various severe weather conditions with different topologies. An interactive web portal built as a part of CARLINK is an effective way of promoting CELTIC Lab test vehicles. CARLINK equipment installed in test vehicles transmits position and data from sensors in real time so it is easy to track vehicles and observe both measured and forecasted weather and traffic conditions. The platform operability, usability and necessity will be approved through few key services. At this point, these services are Local Traffic Weather Service and Traffic Management Service, but supplemental services may be added to the platform based on user requirements and scenarios definition phase, if they are found necessary. The car industry, telecommunication operators, drivers, public transportation, truck traffic and other road users. New cars can have new safety feature to be used in marketing new models. New kind of telecommunication service will bring new kind of business opportunities to telecommunication operators. Private car drivers, public transportation, truck traffic and other road users benefit with new safety features. Equipment manufacturers (fixed or mobile), municipalities, commercial companies (advertising companies, car parking companies). Platform equipment development will bring new kind of products for electronic component industry. Advertising and value-adding services through the platform can generate new kind of private business. Businesses that support the traveller information system.